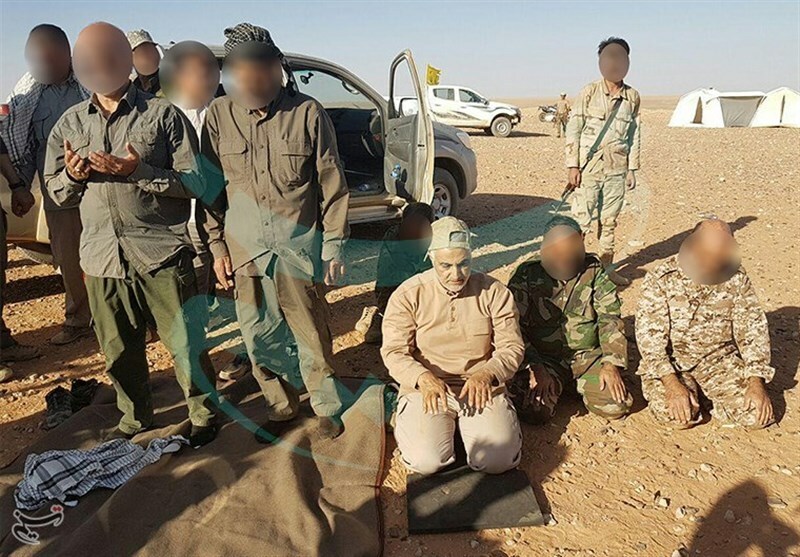 The commander of the Fatemiyoun Division, an all-Afghan militia unit fighting under the Iranian Revolutionary Guards’ leadership in Syria, has rejected media reports that missiles hit its military base near Syria’s northwest over the weekend. “The military base of this Division is near the city of Aleppo. No combatants from this force have been martyred by an attack as reported in the media,” Tasnim News Agency, a Revolutionary Guards mouthpiece, quoted the Afghan Shiite commander as saying in an exclusive interview, without disclosing his name. According to some reports in the Arab media, a Fatemiyoun base close to Nahr al-Bared, located in northwest of Hama in al-Ghab region was hit by missiles, destroying the base and killing several Afghan militiamen. The Syrian government said on Sunday that several missiles targeted the country’s military bases in Hama and Aleppo. Quoting state-run outlets, Tasnim said the attacks were launched from American and British bases in northern Jordan – a claim the Jordanian government refuted. Comment: After Iran and its Lebanese ally Hezbollah militarily intervened in Syria to rescue the embattled Assad regime, Israel began to closely monitor the Syrian battlefield and at times targeted Hezbollah fighters and weapons shipments in southern Syria. But the Israeli military has lately increased the frequency and geographical scope of its strikes inside Syria, targeting Iranian military bases and personnel deep inside Syria. If reports about Israel targeting the Fatemiyoun Division in Aleppo are accurate, it suggests that Israel is determined to go after other Iranian-linked militia forces in Syria as well. This would come as no surprise because Iranian-backed militia groups from Afghanistan and Iraq have established close ties with Hezbollah and have vowed to fight alongside Hezbollah against Israel once the anti-ISIS war is over. Since the start of the Syrian war in 2011, Iran has recruited, trained and deployed thousands of Afghan fighters to assist the Assad regime. The Fatemiyoun Division is the largest single foreign Shiite militia unit in Syria and operates under the IRGC leadership. According to interviews with Fatemiyoun fighters, between 10,000 and 20,000 Afghan Shiites are deployed to Syria and more than 1,000 Afghans have died so far. With ISIS militarily defeated in Syria and Iraq, the Fatemiyoun Division has said its fighters will join Hezbollah and Iranian-sponsored Iraqi militia groups to fight Israel next. “Thanks to the leadership of the Leader of the Islamic World [Ali Khamenei] and your [Quds Force Commander Qassem Soleimani’s] supreme command and prudence, a group of men have now emerged from Afghanistan and joined the axis of resistance. With their respected commander, they have sworn that they will not sit down until the elimination of the international Zionism,” the Fatemiyoun wrote in a statement in November, congratulating the Iranian supreme leader on the defeat of ISIS.